Productivity seems to be a hot topic these days, and for good reason. Increasing our productivity lets us be more effective, getting more done in less time, and leaving more space in our lives for what matters. If you’ve read my post 5 Ways to Increase Productivity or done any other research, you’ve probably seen some great foundational advice on being effective with your time. But what if you want to really take it to the next level and try some more radical strategies? 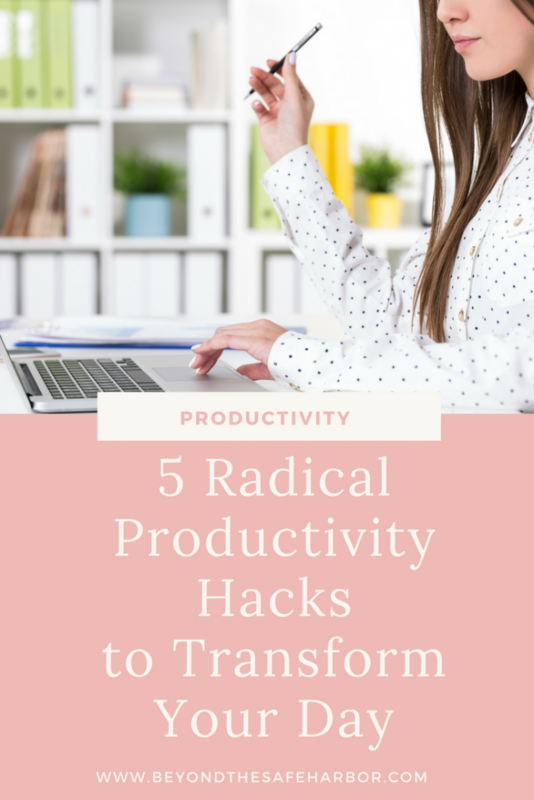 Here are 5 of my favourite productivity hacks for really taking your efforts up a few notches. #1. Unfollow everyone on Facebook. But since actually following through with this tip, I’ve greatly increased my productivity. You see, unfollowing everyone on Facebook isn’t about unfriending them or severing ties, it’s about no longer seeing their status updates in your News feed. 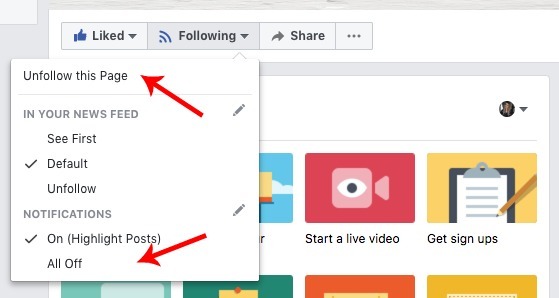 It’s about only following your own business pages or groups (if you have any!) so that going on Facebook isn’t an immediate productivity killer. To unfollow a person, page, or group, simply hover over the “Following” drop down and click “Unfollow”. It doesn’t unfriend the person or unlike the page, it simply means you aren’t following them. Change notifications to “All Off” too for the full effect. Does this feel too drastic? You can always ease into it, or unfollow everyone and then slowly start following any groups or pages that pertain to your work. For example, I follow 2-3 blogging groups since I find the content to be helpful and inspiring. And my worry about missing out? I don’t really feel like I am. I’m still friends with the same people and can check their profiles or send them a message to get in touch. And for those I’m close with, I get updates and can see pictures from texts. I also follow friends and family on a separate, personal Instagram account so that I can keep that separate. Whatever you choose, put practices in place to rid your feeds of unproductive distractions. My post How to Use Social Media the Right Way has additional tips on how to ensure social media isn’t impacting your energy negatively. This hack is one of the most effective, but it takes some getting used to. When you’re working on an important task, something that requires focus, or trying to meet a deadline, turn off your phone to avoid distraction. This will make it easier to avoid checking your email, texts, and social media. And the more you get used to it, the less you’ll even pick up your phone out of habit. If this is too dramatic or if you need your phone for things like the calculator and calendar apps, put it on airplane mode. As a bonus, this helps preserve your battery versus running apps all day long! If even THAT feels like too much, turn off the volume on your phone, or put your phone out of sight. It’s a positive step in the right direction! #3. …and reduce your notifications as much as possible. Wherever you can, turn off push notifications on your phone. This means no emails, updates, or Instagram “likes” lighting up your screen and distracting you. And it means also removing your phone from displaying the icon with the number of unread messages/notifications. Here’s how to do this on an iPhone using Instagram as an example. First, change your settings in Instagram. Click the gear icon next to “Edit Profile”. Scroll down to “Push Notification Settings” (under “Settings”). Turn every relevant category to “Off”. Next, change your settings in iPhone settings. Find Instagram on the list and click it. Toggle “Allow Notifications” to off. I changed my settings like this last year and it’s made a HUGE impact. I can still check my emails and see what’s happening on my other apps, but I have to make a conscious, deliberate effort to open the app to see what’s new. It requires me to sort of “opt in” to the update, versus it being forced on me when I may be in the middle of something. The two apps that I do accept push notifications from are text messages and phone calls, since those tend to be more urgent and I don’t want to have to go into the Messages app just to see if someone texted me. #4. Don’t check your phone for the first hour of the day. This is the last phone-related hack, but it’s a good one! Give yourself the first hour (or even 15 minutes!) of the day completely free of your phone. This means not checking the news, the weather, your Instagram, emails, or anything like that. Instead, use this time to meditate, journal, set intentions for the day, or just practice some gentle mindfulness. Reflect on what you’re grateful for. Breathe. The key is to start your day by design versus by default. How does this impact productivity, you may ask? Well, by consciously starting the day on the right foot with a healthy morning routine, you’re less likely to find your day is derailed by a negative email, mean text, or bad news story. Instead, you have more control over yourself and your outlook, and can then conquer the day more deliberately. Yes, that email may still be there. And yes, that text will still need to be read. But you’ll be consuming this information from a much healthier starting point, making your reaction a more productive one. If you work for yourself or from home like I do, you can even commit to not checking emails until the afternoon. Spend the morning working on your most important projects, and only start to tackle the smaller, more tactical stuff including social media later on. This way, you’re making the most of the start of your day and prioritizing the bigger, more strategic things. #5. Work in strict time blocks. It’s so tempting to multitask. We either stop 5 times in 30 minutes to respond to an email, or spend an hour cycling through various tasks of completely different topics. This is incredibly harmful for your productivity since it takes your brain time to ramp up to a new topic. So if you’re working on a spreadsheet and then respond to an email and go back to the spreadsheet, you won’t be able to fully pick up where you left off. Instead, you’ll probably need to remember what you were doing last and remind yourself of what to do next. This adds unnecessary time and energy that could be avoided. Plus, different tasks use different skillsets, and having your mind cycle from strategic thinking to creative work to email is not the most effective. Instead, work in time blocks. For example, block an hour or two for writing, and write for that time. If you h ave 10 small to-dos for one project, do those 10 to-dos back to back while the project is fresh in your mind. If you have 20 emails to reply to, reply to them back to back if you can, and try to respond to similar emails sequentially. How do you work productively? Have you tried any of these hacks or others? Sound off in the comments and let us know! Thanks for all the wonderful tips. I need to follow the routine and also need to avoid multitasking and using phone..